SWAMP DELTA JOIN THE DOLL QUEUE! L.A. (Leicester Area) all-stars SWAMP DELTA have just unveiled a new video as well as announcing a London show in August. ‘Running From The Island Of The Dolls’ is the opening track from the band’s debut album Sick Liver Blues, which was released this spring. It’s available on CD and download from their Bandcamp page. Swamp Delta headline The Dublin Castle, Camden on Saturday 13 August. Support comes from THE BRONSONS and BRICKS. Tickets priced £5.50 are available here. 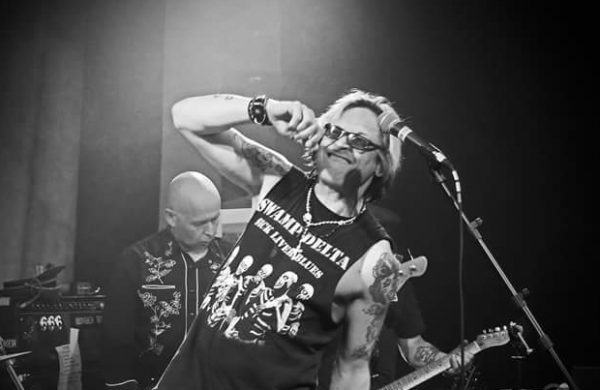 Comprising an assortment of members from Leicester grebo legends CRAZYHEAD and GAYE BYKERS ON ACID, Swamp Delta are interviewed in the current edition of Vive Le Rock! ‹ LOST GLAMSTERS SILVERHEAD REISSUED! Rock and Roll. Last London gig was a sell out. Get tickets fast.